Llewellyn and I are here again in Richmond for the annual HEAV homeschooling Conference. This time we brought Hannah and Lydia along with us. We got here early this morning and pulled in right behind an Amish family. 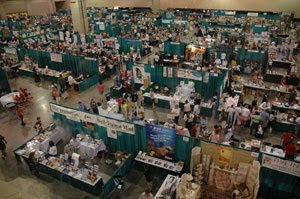 It was a reminder of the diversity of the Christian homeschooling community. There are Amish and Mennonites alongside Vision Forum wannabees and mainstream evangelical families. As Hannah said, the conference is great for people watching. We skipped the morning keynote and visited the exhibition hall. Lydia and I then went to the “Dinosaurs Explained” breakout with Ken Ham from Answers in Genesis (Llewellyn and Hannah went to “What Christians Should Know About College” with Jonathan Brush). As for the session I attended, Ham’s view is simply that dinosaurs were created on the sixth day along with other land animals and became extinct post-flood. He noted that the word “dinosaur” was not coined till the 19th century and that Biblical references to the “leviathan” and the “behemoth” may well have been references to dinosaurs. We had lunch with the McGonigals and Overstreets from CRBC and made it back to visit the used curriculum sale and then to attend Philip Telfer’s afternoon session on “Media Choices: Convictions or Compromise?”. Telfer of Media Talk 101 stressed the amount of time people (especially youth) spend using various forms of media. The average Americans watches nearly 5 hours of television per day and spends at least 2 hours surfing the web. 77% of teens have cell phones and the average teen sends or receives 100 text messages a day. Much of what he stressed could be summed up as time management. Given the 8 hours spent in work and 8 in sleep, how much of the remaining 8 in a day do we want to spend immersed in media? Telfer asked: What if we treated our Bibles like we do our cell phones? What if we would not leave home without it? What if we checked it several times a day for messages? He noted that you can read the entire Bible aloud in about 70 hours. But how often do we read it? We visited the exhibition halls again and then made it back to hear Ken Ham do the evening keynote “Standing on Biblical Authority.” He traced moral and spiritual compromise in the US to the erosion of Biblical authority including especially the traditional interpretation of Genesis 1-11. We then went to supper with our longtime friend and former church member Renee Shockley who is here from Warsaw attending the conference. It's up early tomorrow to go at it again.